It's both healthy and patriotic! 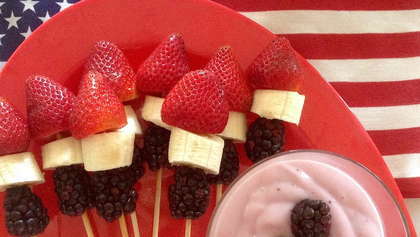 Bring out the red, white, and blue with these fresh-tasting fruit skewers. Store cleaned strawberries and blackberries in refrigerator until ready to serve. Cut banana into twelve 1/2" rings. Place one blackberry, one slice of banana, and one strawberry on each skewer. Fold lemon juice into yogurt and serve as a dipping sauce on the side.